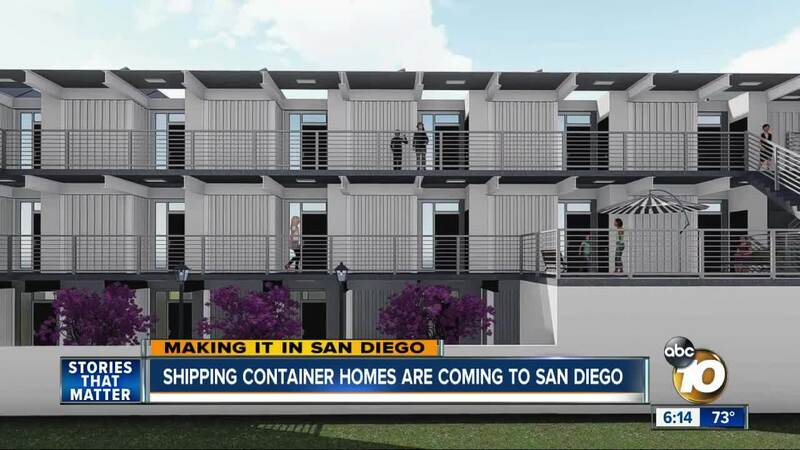 SAN DIEGO (KGTV) - For the first time, homes that are built out of shipping containers are coming to San Diego. In a 10News exclusive report, the developers spoke to reporter Jennifer Kastner about how this could be a housing solution for thousands of San Diegans who are struggling to make it in San Diego. “When you say, ‘shipping containers’, it's like [people] go into the stratosphere,” laughs developer Doug Holmes. He and business partner Michael Copley are with Makana Properties. They’re behind an innovative new project that’s turning shipping containers into livable spaces. “The appeal of containers was really more the speed in the construction,” adds Copley. Makana Properties is about to break ground on a dirt lot in Logan Heights. Artist renderings reveal a finished product that looks like a typical housing complex from the outside. Inside there will be 42 stacked, insulated metal shipping containers. Those will create 21 fully loaded 320 square foot units with a kitchen, bathrooms and patios. The units will be built off-site and delivered to the property. “In one day, literally there's going to be a parade of trucks and a big crane on-site that drops the entire first level,” adds Holmes. The structure will be the first of its kind in San Diego. The concept has worked well elsewhere, like in Orange County where 16 homes were created using recycled shipping containers. Copley and Holmes tell us their project can be constructed in about three months and at a low price. “Right now, we're projecting $140,000 per unit,” says Copley. They believe there’s real potential to see these new homes as a solution to San Diego's housing crisis. The Logan Heights site will be rented out to homeless veterans using VA vouchers, but the developers say this is not an exclusive homeless housing project. It's a rent-restricted project. Makana Properties is already looking to broaden its reach by bringing more shipping container units to the city that can be used by locals of all backgrounds who are in need of affordable housing. “When the project is completed, it really is a very attractive looking building,” adds Holmes. The Logan Heights site will also have a commercial space that the neighborhood can use for meetings and events, at no cost. Construction is expected to start in a few months and be completed as soon as next April.